There are growing signs that a Brexit deal is very close and come as early as Tuesday. A deal can steal the spotlight from the US Mid-Terms. The GBP/USD is not pricing in such an outcome and could shoot higher. The Sunday Times reported that preparations for a deal are "far more advanced than previously disclosed." The Sunday Times triggered a Sunday gap in the GBP/USD. Since then, we have heard Downing Street brushing it off as mere speculation. There have been rumors of a Brexit Secretary Dominic Raab resigning on the details of a deal, later denied. A leaked document from the Environment Department revealed the emergency redeployment of staff to prepare for a no-deal Brexit. Scotland Yard has arranged a "no deal safety net unit" at the cost of 2.4 million pounds. The security force may lose its access to European tools. Reports about stockpiling of food and medicine in case of a no-deal Brexit are also becoming more common. These fresh stories sound like a preparation to push for a deal, also by creating fear about what could happen if an accord is not reached. Prime Minister Theresa May convenes her cabinet on Tuesday, and for a change, no agenda was given to the ministers. Only after Pressure, No. 10 revealed that the cabinet will be debating Brexit, including a no-deal Brexit. The initial secrecy about the agenda and emphasizing the danger of a cliff-edge exit of the EU also smell like something is cooking. ITV's Robert Peston, one of Britain's top journalists, reports that Whips at Conservative Party are rounding up members and asking them about their thoughts. Members of Parliament are usually not shy about their opinions, so this sounds like they are asked about something a bit more specific. Where the whips sent out by the government to sniff around on the potential of support for a particular compromise on the Irish border and the customs union? Brexit headlines are no strangers to GBP/USD traders. Developments on the all-important topic have moved the Pound quite often. Hopes have been supplanted with disappointments only to be replaced again with optimism. At this point, markets are quite wary, and moves are quite limited. The idiom "It ain't over until the fat lady sings" makes a lot of sense to trading these news items. But what if a Brexit agreement finally arrives? An agreement is not priced in, and GBP/USD could jump. Where to? 1.3180 was critical support in late October. 1.3230 was a swing high in October. 1.13300 is a round number and a peak in October. 1.3375 capped the pair in July. 1.3480 limited any rises in June. 1.3615 was the top of the range in May. 1.3700 was a swing low in March. 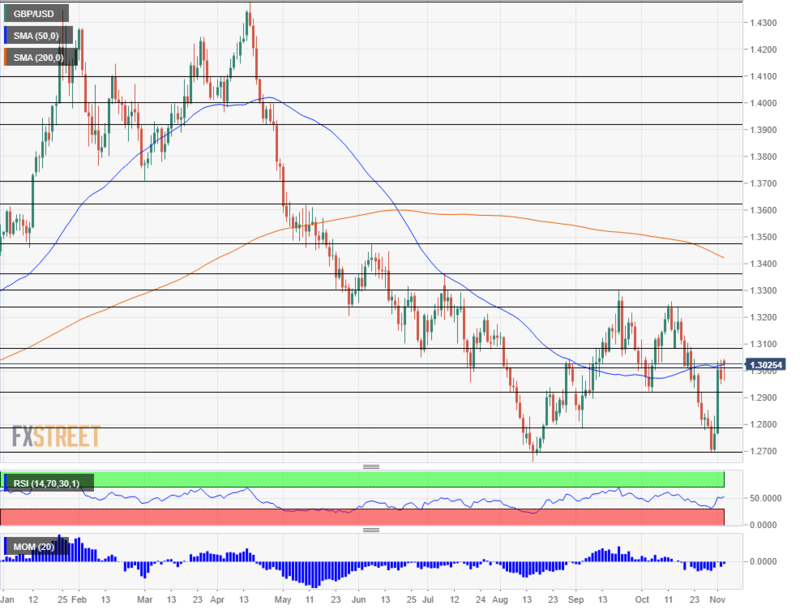 1.3920 provided support to the GBP/USD in April and 1.4000 is the all-important round number that also prevented cable from recovering back then. Even higher, 1.4100 was the top of the range in the Spring. The last level to watch is 1.4376, the highest level post-Brexit. On the downside, 1.3000 is still being battled at the time of writing. 1.2700 was the low point last week.